From just outside the county, but still with Northants connections, Luke Tooth, Nicholas Lees and Peter Mottram-Epson qualified for the plate, whilst Kishan Modi has qualified for the Challengers section opf the Terafinal, so well done to these, and other "out of county" friends that we know were also taking part. The NSCA Annual General Meeting for 2014 will be taking place on Tuesday 8th July at 7.15pm at the Overstone Manor, Ecton Lane, Sywell, NN6 0BB. A number of committee members are going to be taking a step back this coming year, and so now more than ever we are looking for new people to step in and to keep the junior county teams going, and indeed to keep the NSCA going. So, please, do feel free to come along and to find out what you can do to help. If you want to drop us a line beforehand to ask any questions that you may have then you are very welcome to write to us via the contact us page. We look forward to hearing from and/or seeing you soon. Don't forget to get your entries in for this years SSAFA Tournament. This will take place on Saturday 21st June at Ruskin Junior School in Wellingborough, and again this will form the final part of the season's NSCA Grand Prix. All the money from this tournament will be donated to SSAFA - the Soldiers, Sailors, Airmen and Families Association, whose wonderful work you can find out about here. The entry form for this competition can be downloaded here, whilst the latest positions in the Grand Prix after 3 of the 4 rounds can be found here. As part of the UK Chess Challenge, the Rockingham Megafinal involves players from Northants, Leicestershire and Rutland. This year the entry was particularly large, with around 170 players qualifying to compete through tournaments within their schools. At the end of the day, for all the Supremos and Supremas, and for those obtaining 4 points or more, the next stage that they have qualified for is the Northern Gigafinal which is scheduled to take place in Manchester during the first weekend of July (full details here) and through which players can qualify for the national Terafinal, held in Loughborough in the middle of August. Full details of the UK Chess Challenge can be found here, whilst a link to the full results of the Rockingham Megafinal can be viewed here. Photos of a number of the section winners can also be found here. Many congratulations to NSCA "old boy" James Jackson, who through his victory at the e2e4 Hogh Wycombe Open Tournament, has now gained enough ratings points to gain the FM Title (FIDE Master) You can view the cross tables for High Wycombe here. If you've qualified for the Rockingham Megafinal, but still not sent your entry in, you still have a few days left - the Megafinal takes place at Malcolm Arnold Academy next Saturday, 17th May. However, two members of the county under 11 team, and another county player, have already qualified for the Northern Gigafinal in July. 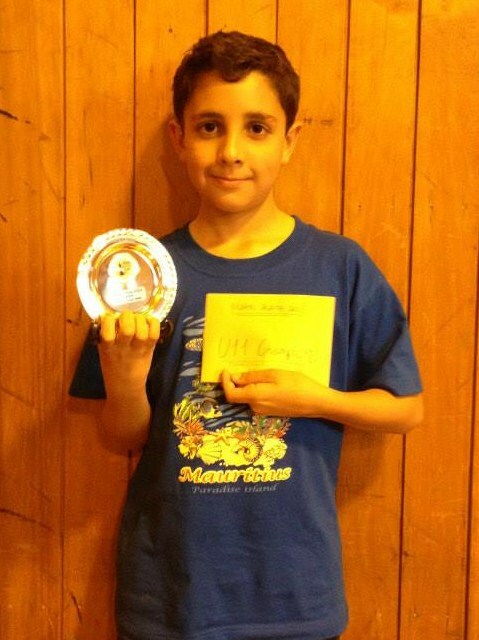 Danyaal Khalid, from over the border in Bedfordshire, participated in the West Anglia Megafinal last weekend in Ely. Whilst just a day after playing in the Under 11 National Finals Santos Fernandes-Coffey also qualified through the Warwickshire Megafinal. Also in that Megafinal James Kearney won his section and with it the title of Under 14 Supremo, and so will also be travelling north to Manchester. Many congratulations to James, and to Danyaal and Santos, and we'll update you as to how many other Northants players make it to the Gigafinal this season. 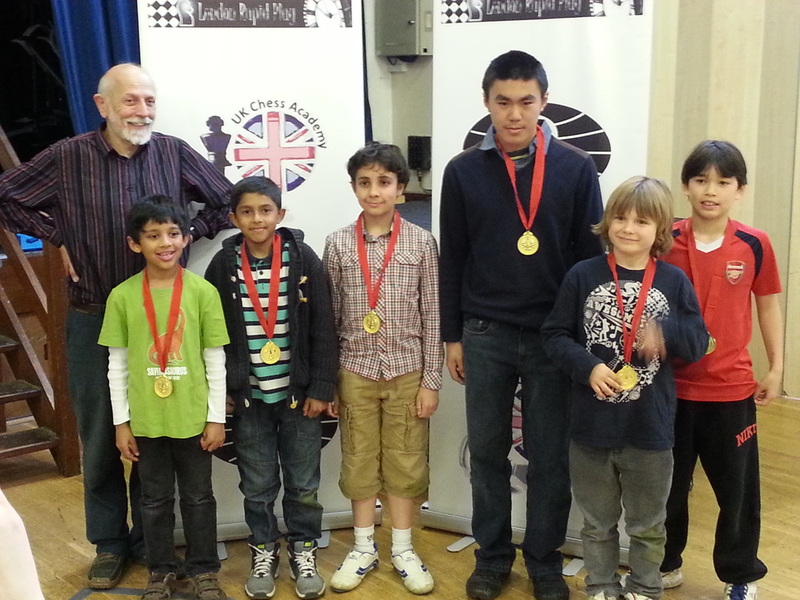 All the UK Chess Challenge details can be found here. Our own Max Miller made the long journey north to Liverpool to take part in this season's EPSCA Under 11 England Trial. This two day tournament involves all the best under 11 players from across the country, and so the level of competition is always extremely high. Taking into account that Max is still actually an under 10, his score of 2 out of 6 was very respectable, and we would like to congratulate Max on representing Northamptonshire so well. Sadly it wasn't enough to qualify on this occasion. He will no doubt come across a few of his opponents at the upcoming Under 11 National Finals taking place on 10th May, and of course still being an under 10 will be eligible to try again next season to gain a place in the England junior quad. If you would like to see all the scores and results from the trial, and also if you would like to know how to go about gaining a place at the next England trial yourself, all the details can be found at the EPSCA website here. Max Miller will soon be attempting to gain a place in the England Under 11 Chess team, when he takes on the best under 11 players in the country at the England Trial in Liverpool. In preparation for this he has been using his Easter holidays wisely, and played in the Maidenhead Junior Congress, and then the Delancy Open Rapidplay and Blitz competitions. At Maidenhead, having had to first of all return the under 9 trophy that he won last year, he left this time with the under 10 trophy after winning 6 out of 7 games. He then followed this up by being the best under 12 in the Blitz, and scored a very impressive 3 out of 7 in the Rapidplay - this last competition is for all ages, up to and including International Masters! So, many congratulations to Max on some great performances, and the NSCA would like to wish him all the best of luck up in Liverpool. The National Chess Junior Squad (NCJS) Championships were again held locally in Daventry, and a number of Northants players took part. 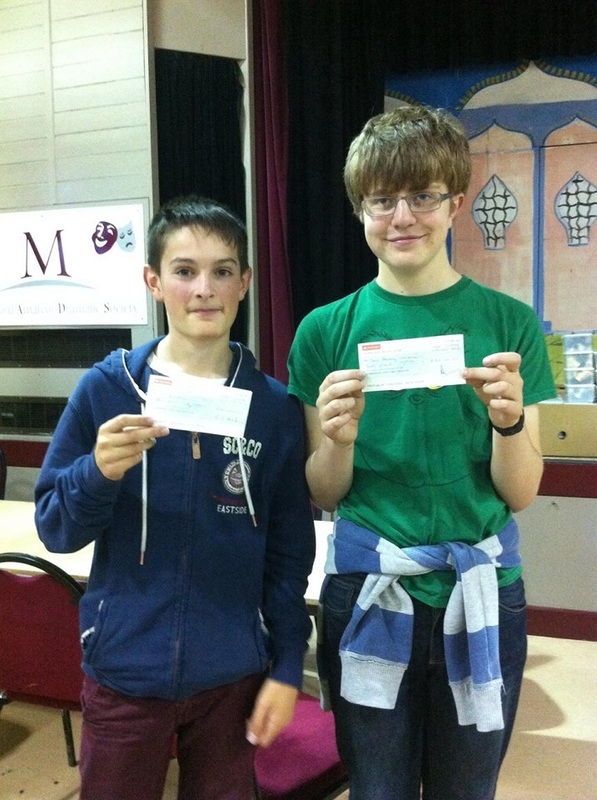 The highest scoring of these was James Kearney, who scored 3 out of 5 in the under 14 section. Also in that section Ryan Reed scored 1.5, but did come away as winner of the Grand National sweepstake held amongst the Northants contingent ! Meanwhile, in the under 16 section Sam Herring scored 2.5, and Owen Robinson 1.5, although Owen wasn't helped by being lucky enough to be drawn in the first two rounds against the two players who finished first and second overall ! In the under 12 section Max Miller scored 2.5, whilst David Collyer scored 2. All the results can be viewed from here, whilst the website of the NCJS can be found here. Well done to all these players, representing Northants so well in a very high quality competition. For full details of how to qualify to play for England, go to the EPSCA website here. Following on from the zonal competitions earlier this month, this final takes place on May 10th, and with all the qualification places now decided those members of the Northants Squad who will be invited to play should have received all the details of the days events. As we are hosting the event this year hopefully the team can do the county proud and make home advantage count! All the zonal results can be found here. The Northamptonshire Chess Association are holding their County Championships during the weekend of May 10th - 11th. 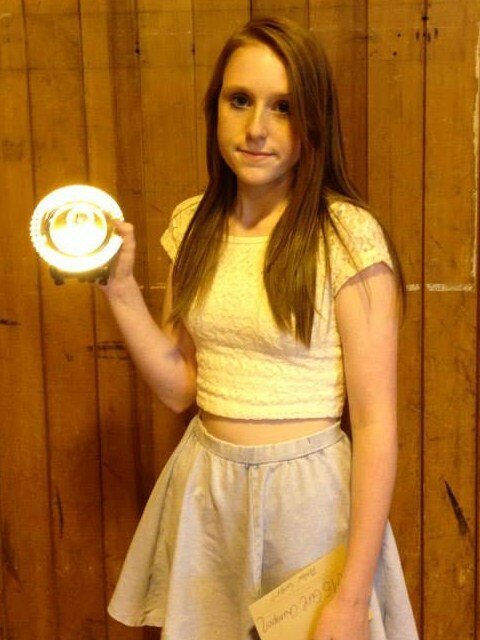 This is for the Cole Trophy, as well as a number of graded prizes and a best junior prize. An entry form can be downloaded here. Meanwhile, if you would like to visit the website of the Northamptonshire Chess Association, you can follow the link here. Again, a bit of catching up to do on all the Northants related Junior Chess news, so please find below a few details of recent events, from individuals at Swindon, to Under 9 and Under 11 matches. Initially the intention was to send both an under 9 team to their respective zonal, and the under 11 team to theirs, but unfortunately in the end this wasn't possible, and so sadly the under 9 team had to be withdrawn. The under 11 team however made the long journey down to Chingford in Essex, to face the tough competition that the East zone always has to offer. Indeed, the winning team from Barnet came away with an extremely impressive 48.5 points out of a possible 60, with Kent only 3.5 points behind them. Going into the last round Northants were still in with a good chance of finishing in the top six, but high scoring last rounds from both Cambridgeshire and Suffolk resulted in a placing of 8th overall. Although this sadly means that the team do not get to the finals via qualification, as we are going to be hosting that final ourselves in May, we are eligible to enter a team on the day. Therefore, those of you that are going to be involved should receive your invites and all the relevant information relating to the finals very soon. If you would like to see all the scores from the East Zonal, as well as those for the North and for the South, you can view all those details on the following website here. Northants sent both an under 11 and an under 9 team to the Midlands Championships this year, held as always in Nottingham. It was great to see so many counties represented this time, making the second place attained by the under 11 team all the more pleasing. The whole team performed well, finishing just 4.5 points behind Nottingham, with notable performances by Joseph Meisner, Josh Khangura, Reece Patel, Noah Bennett, Jake Chandler, and Ibrahim Sheikh, all scoring the maximum 3 out of 3. The under 9 team found it slightly harder going, but still amassed a very creditable 18 points out of a possible 36, with Reuben Hanson also scoring the perfect 3. This competition is one of the major events in the Junior Chess calendar, and as such is one of the tournaments used in the selection of players attempting to gain an England trial or place. This year four Northants players made the trip to Swindon, and all found it quite tough going. Pacey and Tyler Gwynne participated In the Under 12 Championships, scoring 2 and 0.5 respectively, whilst Owen Robinson and Sam Herring took part in the top Major section, scoring 2 and 1 respectively. The cross-tables for the Under 12 Championships can be viewed here, whilst for the Major here. If you should wish to find out all the details of how to qualify to play for England, those details can be found here. The Northants Junior County Chess Championships took place at Malcolm Arnold Academy in Northampton on Saturday 1st February. There was a slight drop in entries compared to last season, but no drop in the standard of play with some great games in all sections. All the County Champions and prize winners can be viewed here. This tournament was also the third part in this season's NSCA Grand Prix, and with one tournament left all the sections are very close affairs, so be sure to keep your diary free for the fourth and final tournament which is due to take place on 21st June. The latest accumulated scores of the leaders in each section can be viewed here. For those players not currently in the county squad who scored well in this tournament, invites to join the squad will be sent out in the next few days, with the first match of 2014 being the under 11 Midlands Championships which will take place in Nottingham on 1st March - details of this match will be sent out to all concerned very soon. Well, due to the web editor not managing to keep you all updated of late, there are lots of scores and results to let you know about as a number of Northants players have already been very busy this year. 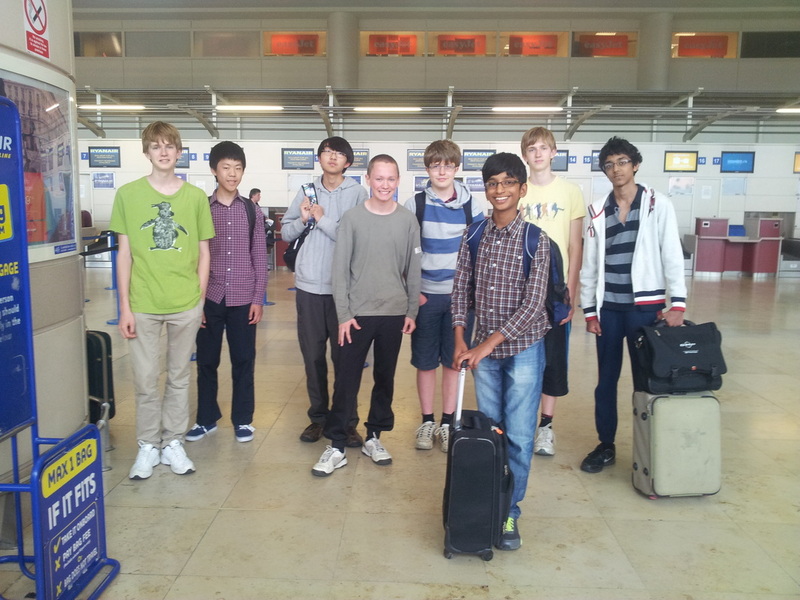 First of all, Max Miller travelled down to the prestigious Hastings International Chess Congress which took place right at the start of January. This tournament has been running for many years, and always has a very strong field taking part. Max was playing in the under 120 grade section, and scored a very impressive 3.5 out of 5, finishing in joint second place, and winning a grading prize. Max got used to playing some rather long games at this one, with one match lasting 4 hours - Max won that game when his opponent ran out of time! The Hastings results can all be found here. Max then played some rather shorter games, when he, along with Tyler Gwynne and Pacey Gwynne, travelled north to Liverpool, to play in the EPSCA Junior Rapidplay Championships. There Max managed to secure his second half norm by scoring 3.5 out of 6, and with that has earned himself a trial for an England Junior Squad place in April. Many congratulations to Max on this wonderful result. Tyler and Pacey, both also needing just one more half norm to also gain a place at the trial, fell just short, but there are still two more opportunities for them (and you if you should wish to have a go!) with the West of England Championships in February, and the Junior Squad Championships at the beginning of April. You can find all the details of how to qualify here. Meanwhile, the EPSCA results can be found via their home page here. Max completed his busy January schedule by travelling to Yateley Manor to play in the under 10 section of the South of England Championships. This he duly joint won with a score of 4.5 out of 6, with the prize money making January profitable for Max as well! Also playing at Yateley Manor were Sam Herring, Owen Robinson and James Kearney in the under 16 section. Full results from Yateley Manor will follow shortly. Max and everybody else can have a little rest now.....until 1st February when it is the Northants Junior County Championships! If you've not got you entry in yet there's still time to enter. You can download an entry form here. The annual Christmas Congress took place at Ruskin Junior School on the 28th December, with a decent turn out of over 50 competitors. This was again also the second part of the NSCA Grand Prix. Details of the winners can now be found here, whilst the latest grand prix positions can be found here. The third part of the grand prix is the Northants Junior County Championships, which take place on February 1st. The season calendar has been updated, and now has a number of further entry forms available to download for a number of important upcoming competitions. In particular, the entry form for the Northants Junior County Championships which take place on Saturday 1st February can now be downloaded either from the calendar page, or directly here. The English Junior Rapidplay competition took place last month, as part of the London Chess Classic at the Olympia Conference Centre in Kensington. This competition pits junior players of all ages against each other, meaning an 8 year old can play an 18 year old! Max Miller represented Northants admirably, scoring 3.5 out of 6 and finishing in joint 24th out of a large field of 91 players. Many congratulations to Max on his continued good form. You can find all the details of this, and the other competitions that took place, on the official London Chess Classic website here. The second set of sections were competed in between Christmas and New Year, and three more Northants players made the trip down to Harrow. In the Under 8 section Reuben Hanson scored a very creditable 2.5 points. In the Under 12 Minor section David Collyer scored an impressive 6.5 out of 9 to earn himself 4th place outright out of 64 players, whilst in the Under 16 section Sam Herring went one place better, finishing joint 3rd with a score of 4 out of 5, including two draws against the two joint winners! For cross tables from these, and all the sections of the London Junior Chess Championships, you can find them via the official LJCC website here. At least 10 players from Northants and the surrounding area travelled down to Harrow in North London to take part in the first weekend of this year's championships, which consisted of the under 14 and under 10 sections. Sadly only one of these was in the under 14 section, with Ryan Reed playing in the under 14 Minor. However, with a score of 4 out of 6 he finished a very creditable joint 6th out of 36 players, so well done to Ryan. We had a number of players in both the Minor and Major sections of the under 10 tournament. In the large Major section of over 100 players, Joseph Meisner and Max Miller were the top Northants players, scoring 4 out of 7 and 3.5 out of 7 respectively. Matthew Lo and Rachael Raine also gave their best in a very tough section. In the Minor the best performing Northants player was Noah Bennett, whose score of 4.5 out of 7 earned him joint 14th out of 83 players! But Northants was also well represented by Thomas Caskey, William Caskey, Jake Chandler and Aashish Reddy. Congratulations to all of these players, for qualifying and for and playing in the London Junior Chess Championships, and lots of luck to those players who will be travelling down to Harrow for the second group of sections between Christmas and New Year. If you would like to see all the cross-tables from these sections you can find them here, whilst the official LJCC website can be found here. Just to remind you that the second NSCA tournament of the season, and the second part of our Grand Prix, will be taking place on Saturday 28th December. In order to get your entry in you can download an entry form right now - you can find it here. Northants was extremely well represented this year at the annual "International" Quadrangular tournament which takes place in Liverpool every December. This tournament brings together teams from Wales, Scotland, the North of England, and the Midlands. They participate in three age groups - Under 16, Under 14, and Under 12. Sam Herring captained the Under 16 Midlands team, which, with the help of Eva Ressell, Owen Robinson and James Kearney, finished a very creditable 2nd. Indeed, James was one of the few players from all sections who scored the maximum 3 out of 3 - many congratulations James. In the Under 14 section Ryan Reed was the sole Northants representative. Despite his impressive 2 out of 3 the Midlands had to settle for 3rd place in this section. Meanwhile in the under 12 section the Midlands again finished 2nd - three NSCA players were present in that section: David Collyer, Shyam Modi, and Kishan Modi. Well done to all these players, who have represented Northants so well in the Midlands team this year - I believe 8 players from Northants taking part must be a record! A few Northants players recently travelled over the border into Leicestershire to take part in the annual H.E. Atkins Memorial Congress. Sam Herring played in the very tough Open section, Owen Robinson in the Major section, and Max Miller followed up his success in Leeds with a grading prize in the Minor section. Congratulations to all three, and to see the cross tables from all the sections you can visit the relevant website here. 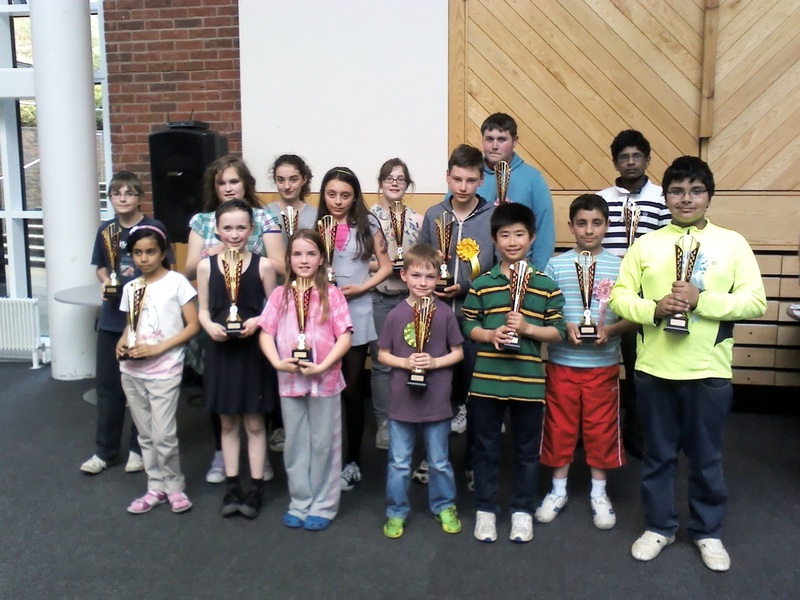 A number of Northants players made the journey up to Leeds to take part in various sections of the 2013 British Rapidplay Chess Championships. Amongst them were three under 11 players attempting to gain a place at the England Under 11 Trial, and through their high scores in the Under 11 one day event Pacey Gwynne, Tyler Gwynne, and Max Miller are all now half way to achieving that. Many congratulations to all three on their wonderful results. There are still a number of tournaments during the season through which you can qualify yourself, so take a look at the EPSCA website here to see where you need to play in order to gain a place too! whilst other sections of the Rapidplay Championships can be found from here. Following on from the Junior Congress, the first leader board of this season's Grand Prix can now be viewed here. The 34th Northants Junior Congress took place at Malcolm Arnold Academy on Saturday 16th November, and was a resounding success. 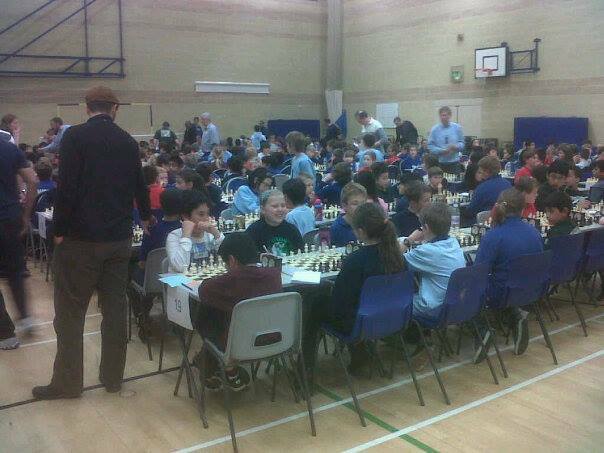 With this competition being a qualifier for the London Junior Chess Championships (LJCC) the turn out was again very high, with well over 100 players coming from county wide and beyond - others travelling from as far away as Nottingham and Sussex! Many congratulations to all the players who took part, and in particular to those who qualified for the LJCC in December. All the winners and runner-ups can be seen on the tournament page here. This was also the first part of this season's NSCA Grand Prix, and the first leader boards will be posted shortly. In the meantime you can find out more about the Grand Prix here. The NSCA would like to send many congratulations to ex junior county player, and current Chessmates top player, James Jackson, who through a wonderful result at the recent London Gatwick Masters has now achieved his first IM norm, IM being "International Master". His name appears on a number of Junior County trophies, so if you are currently the holder of one you might want to check to see if he was a previous winner! In the tournament he finished 3rd overall, just half a point behind two Grand Masters, whom he beat and drew with during the competition! To see exactly how he achieved his IM norm, all the scores can be found here. There's been quite a bit of chess activity by some Northants players since our last update, so here's your chance to catch up with what's been going on! First of all Owen Robinson travelled to Birmingham to take part in their 17th Annual Rapidplay, whilst at the same time Max Miller and David Collyer travelled down to Barnet to play in their Junior Autumn Championships. And for that whole weekend Sam Herring was playing in the e2e4 tournament at High Wycombe! Owen was unfortunately the lowest graded player in a strong Major section in Birmingham, and found the going tough, but still had some really good games. The cross tables for each section can be found here. Meanwhile in Barnet Max had a perfect day, scoring 6 out of 6 and beating 92 other players to the title of Under 10 Champion - many congratulations Max! David had a very good day as well in the Under 12 section, scoring 4 out of 6 and finishing joint 8th out of 43 players, so well done to David too. All the Barnet scores and results can be found here. Sam's trip to High Wycombe resulted in him finishing joint 10th out of 50 players in the Challengers section, for players up to an ECF grade of 175, with a score of 3 out of 5 - another great result. The cross tables for this tournament can be found here. Seven days later Owen and Sam were in action again, this time at the Cambridgeshire Rapidplay, and this time with a third Northants player in attendance - Harry Bowman. Sam finished joint winner of the Major section with a score of 4.5 out of 5, whilst Harry took the Junior prize with a score of 3 out of 5. The cross tables from this competition should be available soon. Many congratulations to both Sam and Harry on their result in Cambridgeshire, and well done to everybody on a couple of successful weekends play. These players will all be ones to watch at the upcoming Northants Junior Congress taking place on 16th November - be sure to get your entries in, and if you haven't already got an entry form you can download one here. This event takes place on saturday November 16th. We are very pleased to confirm that this event is again a qualifier for the London Junior Chess Championships, as well as being the first part of this season's NSCA Grand Prix tournament. An entry form is now available to download here. Having played in the plate competition the day before, Max Miller then travelled to Leamington, along with a few other Northants players, to take part in the 27th Leamington Rapidplay tournament. In the under 115 (Minor) section Max was joined by Harry Bowman and James Kearney - James scoring the highest with 4 out of 6. Meanwhile Sam Herring played in the under 170 (major) section scoring 3 out of 6, courtesy of a win and 4 draws. Well done to all these players (along with both Harry and Sam's fathers!) on some very good performances. All the scores and cross tables can be found here. This competition is run as part of the UK Chess Academy, and a number of local players were involved, some of them very successfully. Owen Robinson and Amber Carter were the under 15 winners, whilst Max Miller won the under 11 boys section, and Nicholas Lees the under 7 boys section. A number of other Northants players were also involved, and all the scores and cross tables for each section can be view via the website here. Congratulations to all those Northants players who made it to this competition. Sam Herring recently played in an England team taking part in an international competition in Southern Poland. The tournament comprised teams from Russia, Ukraine, Belarus, Serbia, Croatia, The Czech Republic, Poland, Wales, and England. Sam scored a very impressive 4.5 out of 7, with his team finished 5th overall out of 18 international teams. Many congratulations to Sam on such a successful trip abroad! You can see all the details by going to the official tournament website here, and all the results for Sam in particular can be found here. You can also read more on the Junior Squad website here. Yes, that right, FREE! If you have never joined the ECF (English Chess Federation) then now is the time do so, as they are offering free Silver membership to new junior members. Among other benefits, by joining the ECF you can often obtain reduced entry fees to tournaments and you receive the bi-monthly ECF news letter. You can see all the details of the benefits here, and view the free offer itself here. 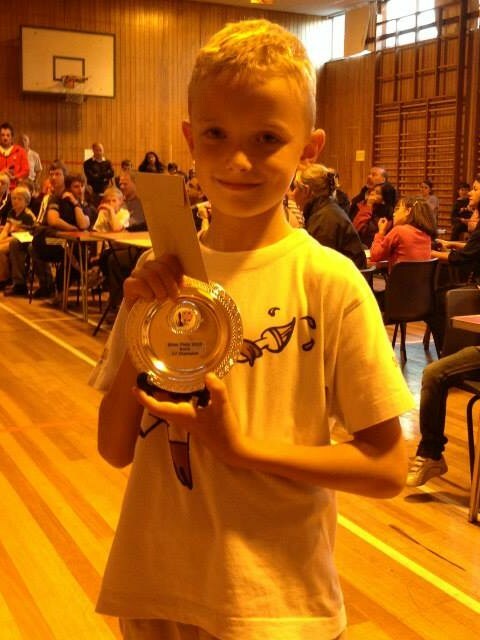 Max Miller gave a faultless performance as he competed in the under 10 section at the recent London Chess Festival - a tournament organised by the UK Chess Academy. He scored a perfect 5 out of 5 to beat the opposition and win the section! Well done Max. Full details of the tournament can be found here. A number of Northants players travelled up to Loughborough for the challengers section of the Tearfinal - part of the UK Chess Challenge. The highest scoring of these was Sam herring who scored 10 points putting him in joint 10th out of 36. Other good performances also came from David Collyer and James Kearney, who both finished on 7 points and joint 21st place. Well done to these and all the Northants players who took part this year. All the overall scores can now be viewed here. And for further details of the competition click here. Another two weeks of high quality chess playing has now been and gone, with 6 Northants players partaking in the second week of this prestigious tournament. This time it was the turn of the Under 14s and the Under 10s. In the older of these sections the final scores for the Northants players (out of 7) were Sam Herring 3.5, Owen Robinson 2.5 and Harry Bowman 2, whilst in the younger tournament (again out of 7) they were Shyam Modi 3.5, Max Miller 3, and Kishan Modi 2.5. It was great to see such a wonderful turnout from Northants this year, and let's hope this bodes well for the next few years - how many can we have at the 2014 Championships which take place in Aberystwyth in Wales?! For the scores, cross tables, and anything else related to the British Championships, they can all be found via the main Championships website here. Well it is almost the end of the first week of the British Chess Championships taking place in Torquay, and a number of Northants players have been giving it their best in a number of different sections. Sam Herring started the week by playing in the week 1 Rapidplay, scoring 2 out of six. 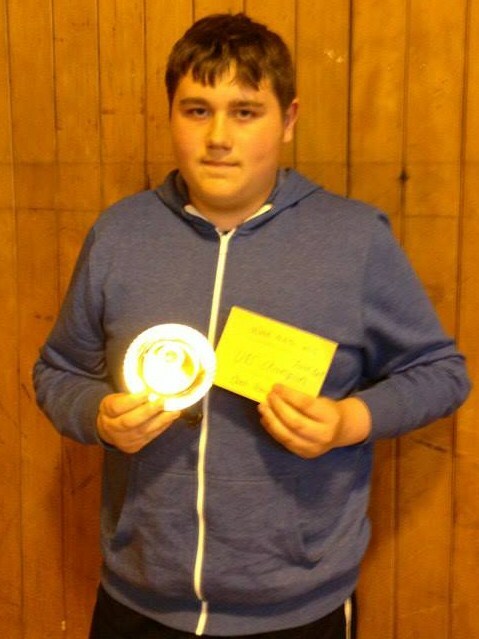 He followed this up with a very good 3 out of 5 in the Under 180 Grade Championship, finishing joint 7th out of 42. Meanwhile Tyler and Pacey Gwynne played in the Under 11 Championship, finishing on 2 and 1 respectively, and Eva Ressel has been playing in the Under 13 Championship - in which she scored 3 out of 7. Well done to everybody. This week more Northants players have travelled down to Devon for the second week of the Championships, so good luck to all those players. We will update you as to how they do, but if you want to see the scores from all of the sections you can find them all here. In readiness for the upcoming British Championships the English Chess Federation have published the new grades for all players. This can be found at a new web address, so you can now find out where you stand on the ECF Grading Database here.